A smile marred by multiple missing teeth can cause many problems for a person. In addition to making them feel extremely self-conscious, it can also have a drastic impact on their oral health. Often, the remaining teeth will shift into the open spaces, and this can easily cause them to crowd and appear crooked. Plus, the exposed gum tissue is much more likely to become infected, and this can lead to even more lost teeth. 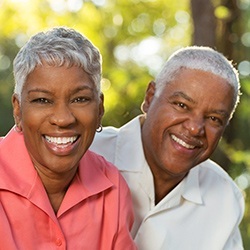 Fortunately, the team at Chaska Dental Center has a solution that can not only give someone their complete smile back but protect their oral health as well: partial dentures. Dentures are made of an acrylic, gum-colored base that is attached to prosthetic teeth. Partial dentures, in particular, are intended to help patients who are missing some teeth throughout their mouth. Unlike a bridge, it is able to help patients who have missing teeth that are not right next to eachother. The denture itself simply slips into place and fills in the gaps like a puzzle piece. They are held securely using metal clasps attached to healthy teeth and can be easily removed to be cleaned. At Chaska Dental Center, you can get a traditional partial denture, or a softer, lightweight kind called Valplast Flexible Partials. Both are extremely effective at helping restore a patient’s smile and protecting them from the issues related to missing teeth. As we mentioned earlier, partial dentures are meant to specifically fit with a particular patient’s remaining teeth. Each one we make is customized for every patient to assure quality, appearance, and comfort. In order to do this, we utilize a meticulous process to make sure they fit perfectly. 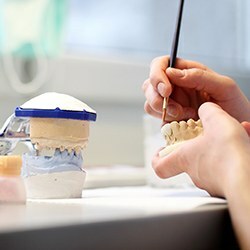 Firstly, our team will take a series of x-rays, scans, and pictures of your teeth and jaw to figure out how they should fit together with the denture. These will be used to construct a series of models that you will try on, and each one will be slightly adjusted to make sure they fit and look better than the last. You will be included in every step of the process so that you know you are getting the exact kind of smile that you want. After both you and your doctor have decided on the final model, this will be used to cast your actual dentures. The entire process usually takes multiple visits spread out over the course of a few weeks. 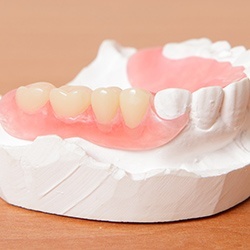 If you’ve been missing teeth for a long time, a new partial denture may feel a bit strange at first, especially while you are talking or eating. This won’t last forever, however, and they should start feeling normal after a couple of weeks. To help this process go faster, stick to softer foods initially so you can get used to chewing with them and read aloud to become comfortable speaking. After meals, you should remove your denture and clean it thoroughly as well as soak it overnight. Cleaning them is very similar to just brushing your teeth, but you’ll need to use products specifically designed for cleaning dentures. Dr. Meschke and Dr. Swingdorf will be able to recommend which products should work best. With the proper care, your partial dentures should easily look like new for the next 5-7 years. How Do I Start Getting Dentures From the Dentist Near Me? If you’re ready to finally have a complete smile again, all you need to do to get started is call the Chaska Dental Center. 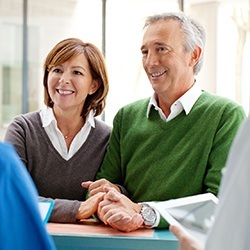 We’ll schedule a consultation, and this will give the doctors a chance to make sure that a partial denture is the best possible solution for you. If you have any questions about partial dentures or want to start restoring your smile, just give us a call today.